Logan Paul a the Teen Choice Awards in Los Angeles. 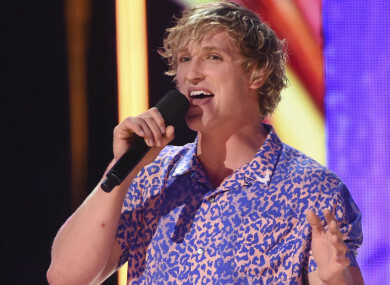 YOUTUBE HAS PUNISHED one of its stars, Logan Paul, over a video that showed a suicide victim in a forest near Mount Fuji — by scrapping two projects and lowering his advertising profile. The video shows the 22-year-old American discovering a body in Aokigahara, a dense woodland at the foot of the mountain known as ‘the Japanese Suicide Forest’, in a country that has long struggled with some of the highest suicide rates in the developed world. Japanese social media erupted with indignation over the film, which showed a man who had hanged himself. Outtakes showing Paul laughing and joking about the incident also stirred anger and Logan was forced into an apology. Paul has a massive teenage and preteen fan base. The video sharing site decided to drop Paul from projects on its Youtube Red subscription platform for original content, a spokesman said yesterday. They include a sequel to his film The Thinning and a leading role in the fourth season of Foursome. Email “Youtube drops Logan Paul after 'suicide forest' video”. Feedback on “Youtube drops Logan Paul after 'suicide forest' video”.